The human brain has yet to explain the origin of one its defining features -- the deep fissures and convolutions that increase its surface area and allow for rational and abstract thoughts. An international collaboration of scientists from the Yale School of Medicine and Turkey may have discovered humanity's beneficiary -- a tiny variation within a single gene that determines the formation of brain convolutions -- they report online May 15 in the journal Nature Genetics. 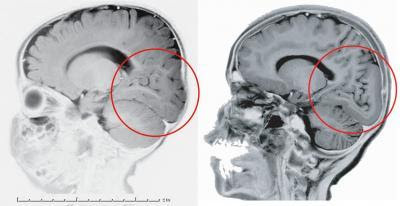 A genetic analysis of a Turkish patient whose brain lacks the characteristic convolutions in part of his cerebral cortex revealed that the deformity was caused by the deletion of two genetic letters from 3 billion in the human genetic alphabet. Similar variations of the same gene, called laminin gamma3 (LAMC3), were discovered in two other patients with similar abnormalities. "The demonstration of the fundamental role of this gene in human brain development affords us a step closer to solve the mystery of the crown jewel of creation, the cerebral cortex," said Murat Gunel, senior author of the paper and the Nixdorff-German Professor of Neurosurgery, co-director of the Neurogenetics Program and professor of genetics and neurobiology at Yale. The folding of the brain is seen only in mammals with larger brains, such as dolphins and apes, and is most pronounced in humans. These fissures expand the surface area of the cerebral cortex and allow for complex thought and reasoning without taking up more space in the skull. Such foldings aren't seen in mammals such as rodents or other animals. Despite the importance of these foldings, no one has been able to explain how the brain manages to create them. The LAMC3 gene -- involved in cell adhesion that plays a key role in embryonic development -- may be crucial to the process. An analysis of the gene shows that it is expressed during the embryonic period that is vital to the formation of dendrites, which form synapses or connections between brain cells. "Although the same gene is present in lower organisms with smooth brains such as mice, somehow over time, it has evolved to gain novel functions that are fundamental for human occipital cortex formation and its mutation leads to the loss of surface convolutions, a hallmark of the human brain," Gunel said. Major funding for the study was provided by National Institute of Neurological Disorders and Stroke through the Recovery Act. Several institutions from Turkey contributed to the paper. Co-lead authors of the paper were Tanyeri Barak and Kenneth Y Kwan of Yale. Other Yale authors include Angeliki Louvi, Murim Choi, Ying Zhu Saliha Yılma, Mehmet Bakırcıoğlu, Ahmet Okay Çağlayan, Ali Kemal Öztürk, Katsuhito Yasuno, Richard A Bronen, Shrikant Mane, Richard P Lifton, Nenad Šestan and Kaya Bilgüvar.